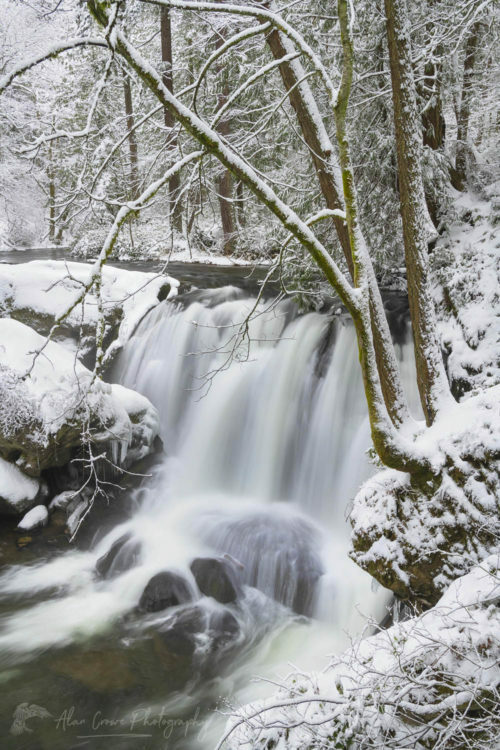 This week much of western Washington was hit by a series of snow storms. Snow amount totals vary, but my home in Bellingham topped off with around 12″. What’s more is that it’s staying cold throughout the week, keeping it all from melting. For most areas of the country 12″ of snow isn’t a big deal. But for us living in the coastal lowlands snowfall of any amount is exciting! 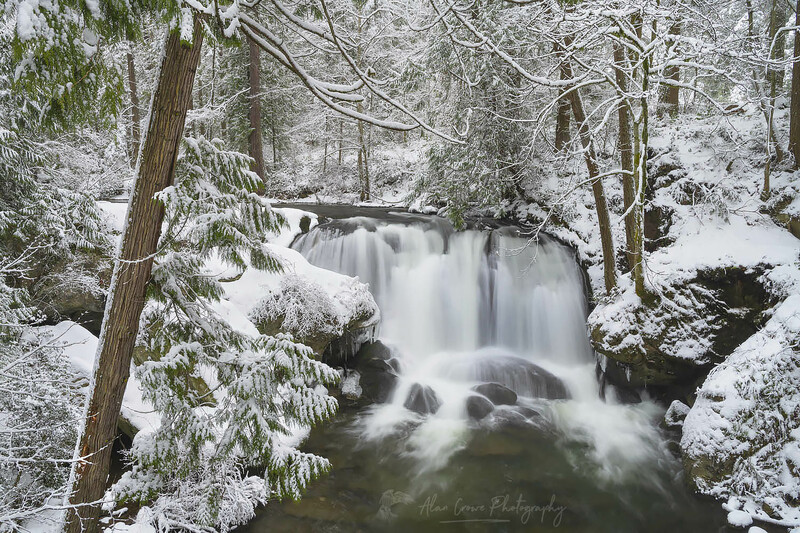 Whatcom Falls is a Bellingham City park that is only about a mile from my home. 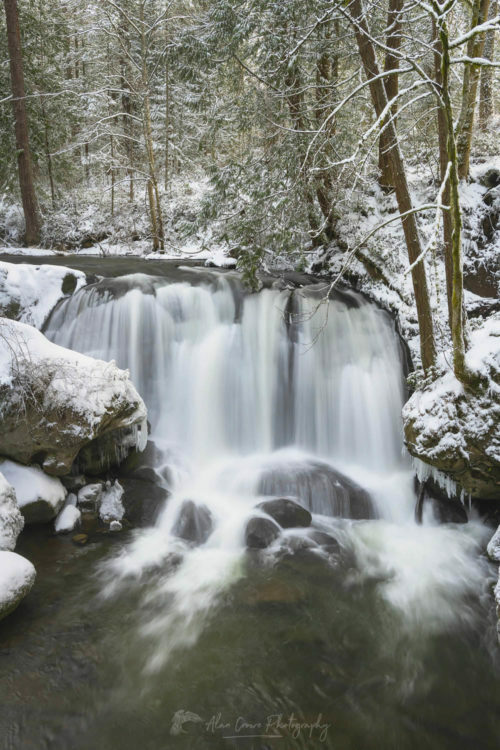 The falls are the main attraction but the park also boasts a beautiful old growth forest with towering fir and cedar trees, and numerous hiking trails. 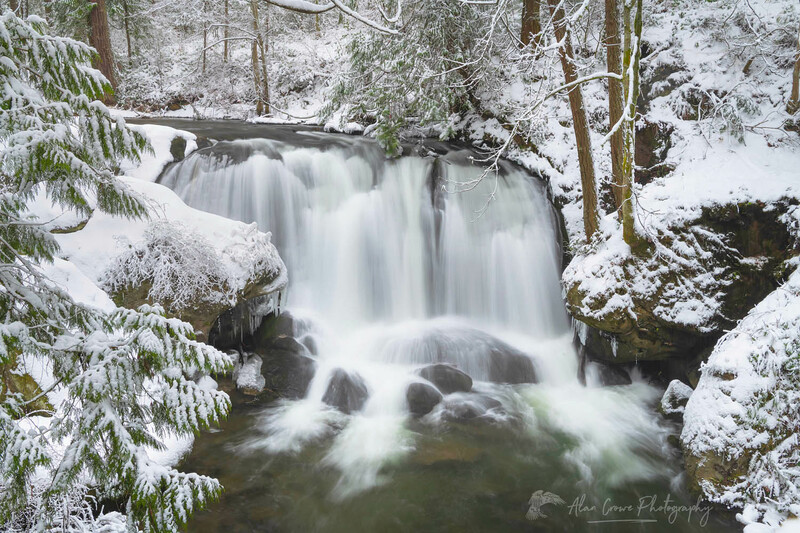 The last time I was able to photograph Whatcom Falls in the snow was around 2008. So to take advantage of the situation I visited the falls three times. Photographing the falls any time of year is ridiculously easy. There is a stone arch bridge spanning the creek at a perfect viewpoint. All you need is a tripod, a lens in the 24-55mm range and maybe a polarizer. 2018 is turning out to be a year of new beginnings. Along with the launching of my new website comes this first blog post of the year, featuring several new images. These new photos are even more special in that are the first made using an entirely new camera system. Last week during a brief window of decent weather I took a short break from working on the new website. This break enabled me to finally get out in the field to test out my new Nikon D850 camera system and a couple new filters. I find reading and writing reviews of photo gear a huge bore. So, if you’re interested in my opinions of the D850 you can contact me. I’ll be happy to share my first impressions. 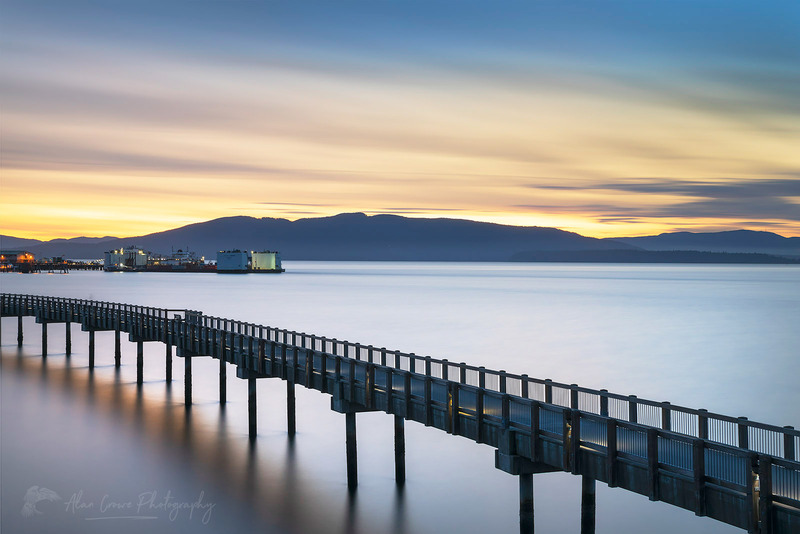 The first photo above is from Boulevard Park, along Bellingham Bay. 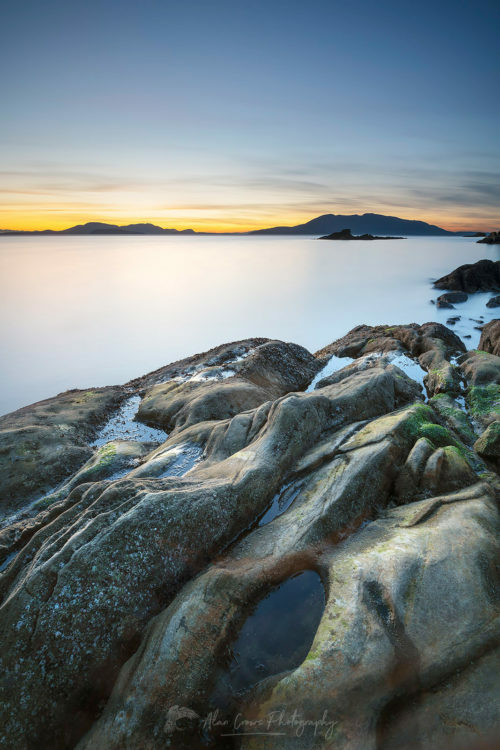 Aside from the new camera and lens, this was my first photo using a Lee Big Stopper filter. For those not familiar, the Big Stopper is a neutral density filter that dramatically increases the length of exposure. This extended shutter speed results in any movement becoming blurred. In the case above, the sky and water took on a silky texture. Photographing after sunset during the “Blue Hour” adds to the mood with cooler saturated tones. 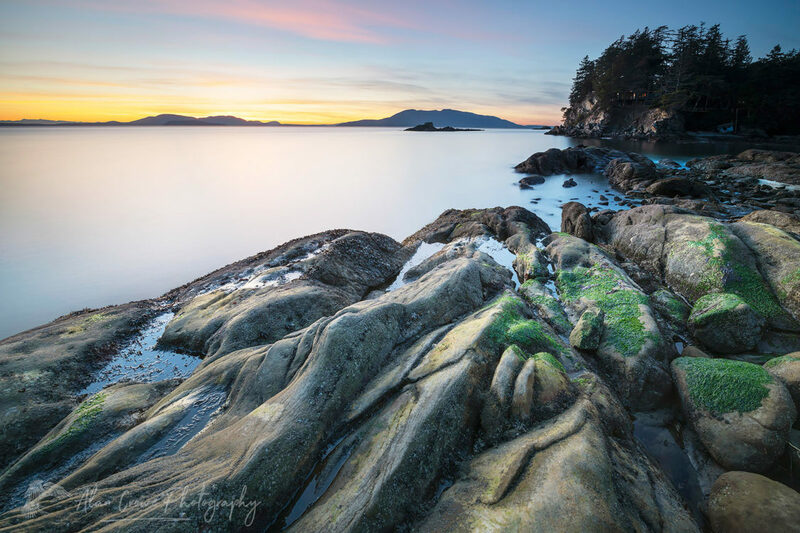 The next day I decided to head down to one of my favorite local winter destinations, Larrabee State Park. Usually I stop by Clayton Beach on the south end of the park. 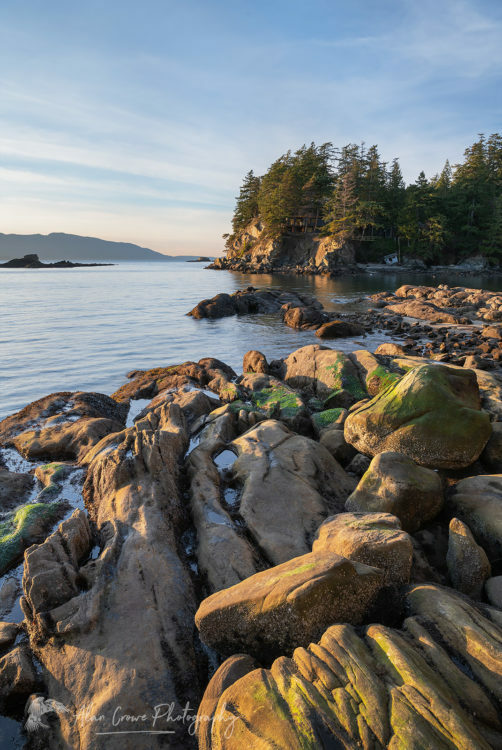 However, since I’ve made numerous photos from that great location I decided to check out Wildcat Cove beach. I haven’t been there for many years and I forgot how scenic it can be. The tide was going out, exposing some interesting and extremely slippery rocks. The winter light was also warm and pleasant with some nice wispy high clouds. Since it was mid-week there weren’t many people. So it was nice to leisurely set up my gear and make a few photos as the sun went down. I wanted to get in more practice with the Lee Filters so I made couple more tries. Exposures of even a few minutes long seem to take forever when it’s getting dark and cold!